This is just a quick update on my previous posts about the distribution of chocolates in tubs of Celebrations. 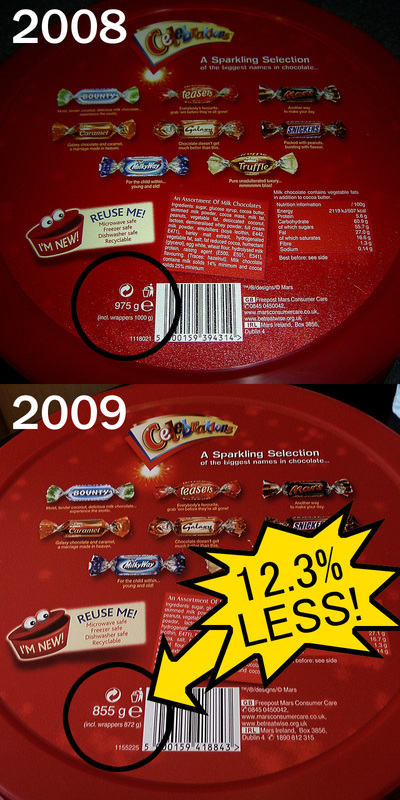 I recently purchased two tubs and noticed a change in the distribution, mainly because there is now 12.3% less chocolate (by mass) in a tub than there was in 2008! This means a typical tub contains around 95 chocolates, down from 107 previously, presumably in reaction to the Current Financial Climate. Two tubs is not enough to make any strong inferences about exactly how the distribution has changed, however, it does seem as if the previously over-represented Mars, Snickers and Bounty account for most of the reduction, with the much-coveted ‘Teasers’ remaining the same at 13 per tub, and the rarest Galaxy chocolates may even have increased from just 22 in a tub to perhaps 25 (adding all three types together). Personally I still consider Celebrations to offer a superior selection, and there may well have been similar stealthy reductions in other chocolate collections. Perhaps in 2010 we can look forward to a return to 1kg tubs, no doubt accompanied by much fanfare proclaiming “14% more!”. This entry was posted in experiment and tagged 2008, 2009, celebrations, experiment. Bookmark the permalink.